The use of multiple medications, often referred to as polypharmacy, is on the rise among U.S. seniors. 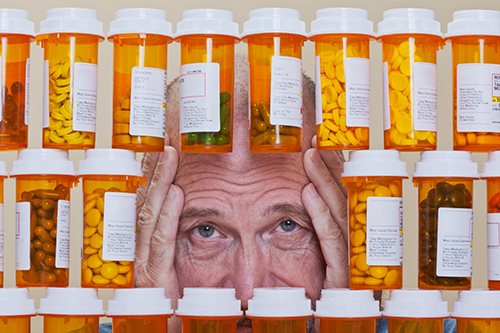 Nearly 40% of Americans 65 or older take at least five or more medications. Yet, previous studies have shown that older adults with polypharmacy are more prone to adverse events and hospitalizations than those taking fewer medications. Though few studies have investigated individual, genetic risk factors for adverse drug events in this population. In this pilot study, the investigators hypothesized that older adults with polypharmacy and increased hospitalization rates would have more genes associated with altered drug metabolism or lack of sensitivity to certain drugs than those with fewer hospitalizations. The Columbia team completed pharmacogenetic testing to identify five genes—CYP2C19, CYP2C9, VKORC1, CYP2D6, and CYP3A4/5—in older adults with polypharmacy. The study included six seniors who had been admitted to the hospital at least three times over the past two years and six age-matched controls who had fewer hospitalizations. Both groups had an average age of 77 years and were taking an average of 14 medications. Specifically, in the higher hospitalization group, each of the participants had at least one of the mutations, and half had more than one. None of the controls had any of the mutations. Due to the small size of the pilot study, the Columbia investigators are planning a larger clinical trial to investigate whether the identification of drug-metabolism-altering mutations in adults with polypharmacy may improve outcomes.